While on holiday in New York in September 1988 I had the opportunity to study large numbers of American Herring Gulls (Larus smithsonianus)*. On observing a group of 1st winters I realised I had previously seen a similar gull in Cobh, so I spent some time studying them and taking notes. On my return I immediately consulted my notebook where I had written a description of an 'odd' 1st winter Herring Gull that had been present in Cobh in 1986 from 16th November to mid-December. Comparing notes taken on both sides of the Atlantic convinced me that the Cobh bird was in fact an American Herring Gull. Size: Definitely larger than the local argenteus Herring Gulls, although not as big as Great Black-backed Gull L. marinus nor as slim as Lesser Black-backed Gull L. fuscus. Wings and Tail: Less contrast between the dark centres and pale edges of the mantle, secondaries and coverts. These were darker brown on the median and lesser coverts although not as contrasting as on 1st winter Lesser Black-backed Gull. Unlike 1st winter Lesser Black-backed Gull, the inner primaries were a paler brown than the dark brown outer primaries and secondaries. The rump was a more uniform brown than argenteus Herring Gulls. The tail was almost completely uniform dark brown/black apart from some paler patches at the base of the tail feathers. Head and Undersides: The head was quite distinctive with a different overall expression when compared to argenteus Herring Gull, appearing longer with a heavier bill and a 'tougher' expression, vaguely similar in structure to Glaucous Gull L. hyperboreus. The bill showed a black tip with a paler pink/brown base. The first feature to draw my attention to this bird was the colour of the head and undersides, which made it stand out when seen among a group of argenteus Herring Gulls. The	head,	throat,	breast	and belly were an almost uniform mid tan-grey apart from faint mottling on the side of the neck and breast, nape and fore-flank. The undertail-coverts were coarsely mottled with a mixture of light and mid brown, not showing much contrast with the rest of the undersides. The eye was dark as were the feathers surrounding the eye in contrast to the rest of the head. The legs were pale flesh-pink and the bird was either deeper breasted or shorter-legged than the argenteus Herring Gulls. Overall impression: Stockier, slightly bigger, heavier billed showing a noticeable overall tan-brown colour in comparison to the argenteus Herring Gulls. I have observed many thousands of 1st winter argenteus Herring Gulls in a variety of plumages previously, but none have shown a combination of this birds almost uniform tan-grey wash and size and structural diferences. It was seperable from other 1st winter Herring Gulls with little difficulty. This represents the first Irish record (Irish Birds 4(2): 246). American Herring Gull Larus smithsonianus is the most abundent large gull over much of North America. Previously regarded as a subspecies of Herring Gull, it was recognised as a full species by the IRBC in 2004. Up to the most recent Irish Rare Bird Report (31st December 2015), there have been a total of 97 Irish records. 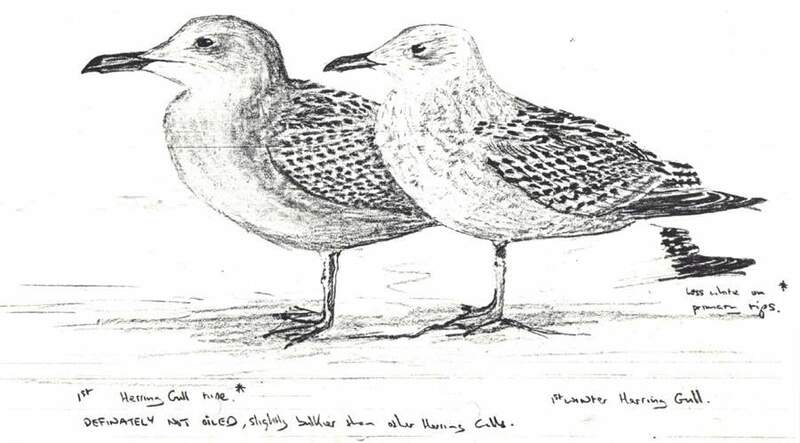 The first record for the Western Palearctic was a 2nd winter caught onboard a ship that was in the Bay of Biscay 260 nautical miles off the coast of Spain in November 1937. This bird had had been ringed as a chick on Kent Island, New Brunswick, Canada in August 1936. The bird at Cobh in 1986 was the second Western Palearctic record. 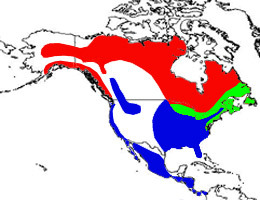 Elsewhere in the WP it has been recorded in Britain, France, Spain, Portugal, Norway and Iceland and outside the WP it is probably regular in Greenland.